Can You Get 12/15 Correct On This World Geography Quiz? 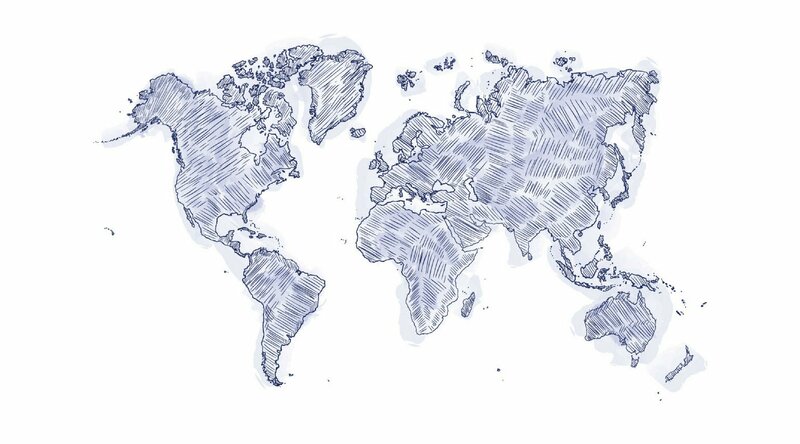 A sketch of a world map. Home/Destination Immersion® Experiences Blog/Can You Get 12/15 Correct On This World Geography Quiz? Azamara guests are a well-traveled bunch. After all, we’ve been taking you to some of the most amazing destinations on earth since 2007. Our three boutique cruise ships call on hundreds of ports across the globe, in all seven continents. Are you ready to test your travel knowledge with a world geography quiz? Don’t forget to brag about share your results on social media, and challenge your friends to beat you! Why is Japan known as the Land of the Rising Sun? In Bora Bora, putting a flower in your right ear is indicative of what? Surely you’ve heard news of the ‘Antarctica Pyramids’, suggesting an ancient civilization once resided there – but how many residents call Antarctica home, today? In what year did the Moai island of Rapa Nui, also known as Easter Island, become a part of Chile? Though you may think of Norway when it comes to the spruce or maple, it’s also the world’s largest exporter of what? Which Italian city was once a major mercantile power, as well as its own country, until the end of the 18th century? Why is Alaska known as The Last Frontier? What is Auckland, New Zealand’s second name? Keeping with the trend of nicknames for cities, Havana has a particularly unique one based on its architecture – do you know what it is? Which major geological feature inspired Kenya’s name? The world’s largest canal system can be found where? Amsterdam’s coffee shops are in abundance thanks to a population that drinks more than how many cups, per person, per day? Do you have your guesses ready? Here come the correct answers. South Africa has eleven official languages: Afrikaans, English, Ndebele, Northern Sotho, Sotho, SiSwati, Tsonga, Tswana, Venda, Xhosa, and Zulu. Did you know we’re cruising to South Africa in 2020? Check out the itineraries here. China was already a formidably advanced culture when Japan was in its infancy. When Japan was described during its culture’s youth, it was by the Chinese, who looked east to see the island, towards the dawn. We love cruising to China, especially Hong Kong. You can browse upcoming voyages here. In Bora Bora, putting a flower in your left ear signifies that you have someone special in your life – but putting it in your right ear means you’re single and looking. Keep that in mind for 2020, when Bora Bora, French Polynesia, is one of our maiden ports of call! Actually, Antarctica has no permanent residents. As for that (debunked) pyramids theory? We’re not sure about that, either. Read this blog to discover more cool facts about Antarctica! Construction of the Panama Canal was completed in 1914, overseen by Theodore Roosevelt. The Panama Canal is a must-see destination for every cruise traveler. And we have voyages there coming up! View them here. Though Easter Island (and its monolithic human figures) wasn’t opened to the public until 1966, it was annexed by Chile in 1888. Last month, we dove into the fascinating history and culture of Chile with this article—a must-read if you’re considering cruising there! Norway is the world’s largest exporter of salmon, and is second in seafood exports overall. Eat it fresh when you cruise to Norway with us! Venice, known as the Republic of Venice, was once one of the most powerful and wealthy players on the European stage. Today, it’s one of the most popular travel destinations in the world. All three of our boutique cruise ships have upcoming voyages calling on Venice. To this day, many of Alaska’s regions are still so lightly settled that the nickname The Last Frontier continues to see use. When you cruise to “The Last Frontier” with Azamara, you don’t have to settle for just exploring the coast. Our Land and Sea Packages will take you inland, as well. Auckland’s second name is "The City of Sails" and is home to two major harbors as well as the highest boat ownership per capita. Sail with us to The City of Sails! Browse all Auckland voyages here. The gorgeous colonial architecture that Havana is known for includes many columns, contributing to the city’s nickname: Ciudad de las Columnas, or the City of Columns. The best way to visit Cuba is by cruise. Find out how you can voyage there with Azamara. At over 17,000 feet high and the highest point in the country, Mount Kenya inspired the country’s name. Mombasa, Kenya, will be one of our maiden ports of call in 2020. Join us on a luxury cruise to Africa! Many of us would lean towards Venice, but it is, in fact, Australia’s Gold Coast that claims that crown. We’re offering voyages to Australia in 2018, 2019, and 2020. Join us onboard in the land down under! Galapagos penguins defy the odds and live among a variety of fascinating wildlife in the Galapagos. When you cruise to South America with Azamara Club Cruises, you can visit the Galapagos during an exclusive post-cruise experience, in partnership with Celebrity Cruises. We bet you’ll even spot some Galapagos penguins during the journey! The residents of Amsterdam drink, on average, more than 3 cups of coffee per person per day! The highly caffeinated city is also one of our favorite travel destinations. Check out our upcoming cruises to Amsterdam. Did you manage to score 12 out of 15 correct? Or even better? Don’t forget to share your results on social media! If you want more travel trivia, check out our previous article, Travel Trivia: 29 Fun Facts About the World.